Le Chameau Country Lady Fourree Wellington Boots. Rain boot with a wool lining in order to keep you warm throughout the winter. A feminine style thanks to a slightly curved shape, a decorative buckle and an upper leg trim. A real multi-purpose rubber boor with its all-terrain grip sole. 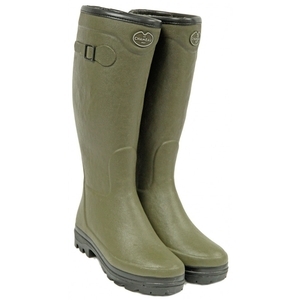 I have just bought my 3rd pair of wellies from Uttings and as always the service is excellent. I spend more on wellies than any other footwear and I am just thrilled with my new Le Chameu Country fleece lined boots! They are so warm and snug and a perfect fit...bit too cumbersome. I have always had Aigle Parcour Varios but find they split because 5hey are too wide...still love them..however my heart is set on these now they are truly fabulous. Plus I git an extra 10% off...so thank you! Wife delighted very warm and confortable. Love these wellies. I was reluctant to spend so much money on wellies but dont regret it. Lovely and warm and really comfy have walked miles in them and think theyll last forever so all in all well worth the money! They are quite narrow at the top so if you have large calves you may be better with a different style. This is the second pair of boots which I have had. They are so comfortable and I can wear them without socks! These are fantastic I have spent the last weekend at a festival and Ive worn these wellies with no socks and been extremely warm and comfortable! Would recommend!